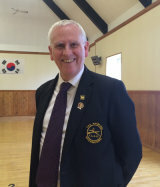 Colin Mowatt 4th Dan International Instructor. moved to Jersey. In 2010 I became a full time instructor to focus on Taekwon-do without other work commitments. We now have one of the largest clubs in the area with over 120 students. I regularly officiate at the various competitions held by the T.A.G.B. which have included World Championships and I also attend our local coloured belt gradings on the black belt theory table.